This tour operates daily, except Wednesdays - see schedule. It is free of charge and no reservation is needed. Participants are accepted in the order of arrival and to the extent of available space. This tour is not recommended for people with walking difficulties or health problems. The tour starts at 45 Yefe Nof Street, and lasts 50 minutes, ending at the main gardens entrance on Hatzionut Avenue. 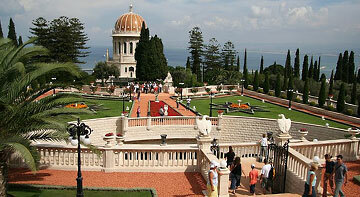 The Panorama Tour descends through the Haifa Bahá’í Gardens from the crest of Mount Carmel to the level of the golden-domed Shrine of the Báb along paved paths and stairs. You will pass through both formal and informal parts of the gardens and enjoy magnificent views of the city, the Galilee Hills, and the Mediterranean Sea. Your guide will tell you about the design and maintenance of the gardens, as well as their significance to Bahá’ís. You will learn about the history of this community, how they came to build their world centre on Mount Carmel, and what activities are carried on in the buildings located in the gardens, including the shrine. The tour is free of charge and no reservation is necessary. Participants are accepted on the spot in the order of arrival and to the extent of available space. It is advisable to make arrangements in advance for organized groups of 18 people or more and those with special interests. Tours may be cancelled without notice in case of rainy weather or other conditions affecting the safety of visitors. Since the slope is steep, this tour is not recommended for people with walking difficulties or health problems. The Tour entrance is located at 45 Yefe Nof Street, 100 meters west of the viewing balcony (61 Yefe Nof Street). You should plan to arrive about 15 minutes before the start of one of the tours shown on the schedule above. The tour lasts approximately 50 minutes and ends at the main entrance to the gardens on Hatzionut Avenue. You can return to the starting point by taking bus 136 (23 on Saturdays) or a taxi. This tour operates Saturday mornings at 10:30 and 12:00 and is currently available in Hebrew only. It is free of charge and no reservation is needed. Participants are accepted in the order of arrival and to the extent of available space. Visitor registration begins 15 minutes prior to the start time. The tour starts at the main entrance to the gardens and lasts approximately 1 hour and 15 minutes. Since this tour passes in close proximity to the Shrine of Bahá’u’lláh, kindly wear clothing that covers your shoulders and reaches your knees. The Bahá’í Gardens are religious sites that are open to the general public without charge. As in most other such sites, visitors are asked to dress modestly, to help keep the place clean and beautiful, and to behave in a manner that is considerate of the sensitivities of others. Dress: Please wear clothing that covers your shoulders and reaches your knees. Because of the pebbled paths and occasionally slippery pavements, we recommend wearing comfortable shoes with good traction. During the summer months, consider bringing a hat and sun screen. Photography is permitted, except for the interior of the Shrines. Food and drink: Visitors are welcome to bring their own bottle of water, but drinking other beverages, eating, chewing gum and smoking are not allowed inside the gardens. Other prohibitions: Kindly do not bring animals or weapons. Gardens closed: The gardens are closed on Bahá’í holy days and Yom Kippur. They may also be closed temporarily in rainy weather.